Writing can be quite difficult. The pen should not be forced across the paper. Words should flow and pick up momentum on their own, falling into place as clear expressions of thoughts. Sometimes I have to wait a long time for my muses to appear and that can be really hard. Breakfast, on the other hand, should never be difficult, especially on a lazy weekend morning. After a long week of rush, rush, rush, we always look forward to the weekend – no alarms, no deadlines and very little on the calendar. What to eat can be a challenge. I often ask my little sweetheart what she would like. The response is usually either pancakes. How exciting. Well, one morning a while back, I had this crazy idea to shake things up a bit. Inspired by Shawn and those yummy donuts he made for us over Christmas (his mom’s recipe which I will give you if you’re good), I whipped up a batch of apple fritters that turned out to be nothing short of amazing. It was a very successful experiment. An apple went into my fav pancake recipe, blobs of which got fried in peanut oil and tossed into cinnamon-sugar. These oddly shaped fluffy nuggets with warm, soft little cubes of sweet-tart apple inside were the result. Tomorrow, we leave for Cambria, a sleepy seaside town on the Central Coast resident to artists. There is nothing to do there but eat, sleep, repeat. We will be winding down and banishing the clock for a few days. Everyone and everything seems at ease there. 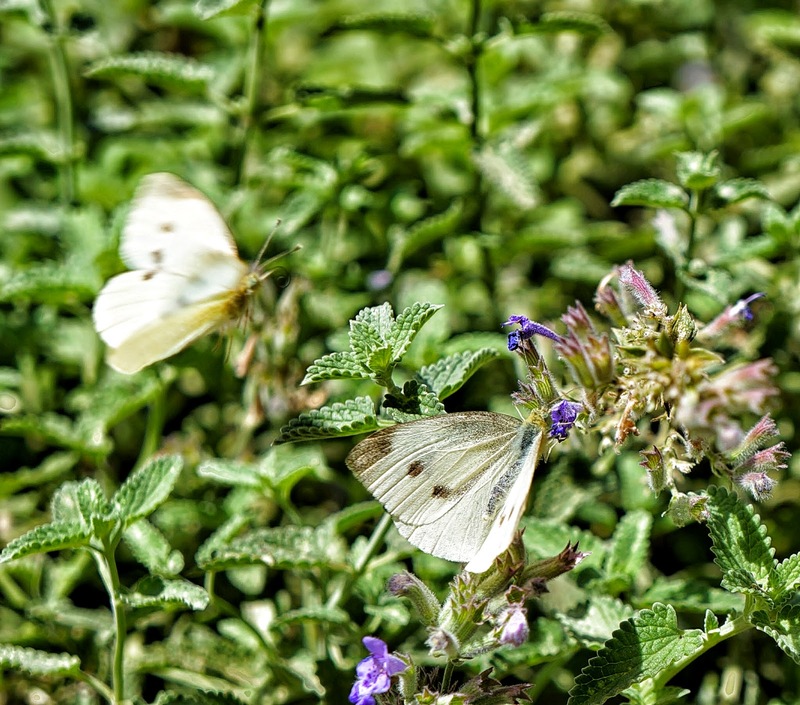 Nature flourishes with bees buzzing over rosemary blossoms and happy butterflies fluttering around wildflowers. Before we hit the road, I want us to have a special, but quick breakfast of warm apple fritters. No special equipment is needed to make this recipe, but I suggest you grab yourself a spider. 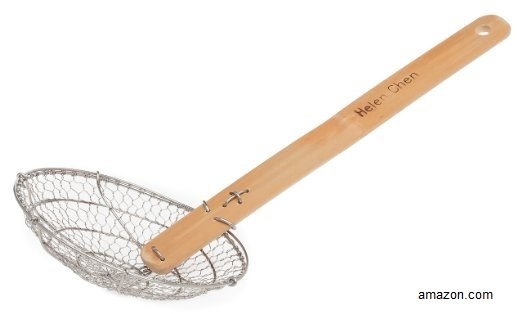 It’s a Chinese cooking tool with a wooden handle and a metal spider-web head, perfect for scooping goodies out of hot oil. It also works well for fishing pasta out of boiling water. For frying, I prefer peanut oil as it will carry a high heat great. Heat a couple tablespoons of butter just until melted. Add vanilla, lemon zest and melted butter. Sift flour, baking powder, sugar and salt into a big bowl. Gently stir egg mixture into dry ingredients. Wash and peel apple. Cut into small, 1/2-inch cubes. Add the apple to the batter and stir until just combined. Let the batter rest for a few minutes. Line a dish with a couple sheets of paper towels and set next to stove. Mix 1/2 cup sugar with another 2 tsp cinnamon powder in a small, shallow dish and set aside near stove. Test oil with a drop of batter. It should float to the top and bubble. Drop heaping tablespoons of batter carefully into the hot oil, maybe 3 or 4 at a time. Do not over-crowd the pot as it will bring the temperature of the oil down too much. Use a spider to flip dumplings gently so cook the other side. Remove and set onto paper towels to drain. Toss into cinnamon-sugar and coat well. Cambria is such a magical place. A drive along the coast calls for a beautiful vintage convertible. After my parents arrive, Daisy rushes to greet them and help G’Pa polish his Triumph. What she loves even more is splashing around the pool with Daddy and looking for critters in the tide pools. I’m looking forward to doing a whole lot of nothing. Maybe I will learn to sit for a while. Our days will be slow, just strolling around the little seaside town, looking at beautiful creations by local artists on display in cute shops. Wine and cheese by the fire with my family will start the evenings before dinner. As any salty sea captain will attest, taking in that crisp, sea air is the best thing for a tired soul from the bustling city. We have a very long drive ahead of us, so we will need to be well organized for the morning with a breakfast that will celebrate the start of our family vacation. That means a very tall cup of coffee and a treat. I cannot think of anything easier and more delicious that warm apple fritters tossed into cinnamon-sugar fresh out of the hot oil. Love this amazing idea… Never know that pancake batter + apple + frying can make such lovely treats. Even better with this lovely vacation. These look so delish! You make things look so easy! Your trip is so beautiful and I'm sure you had a wonderful time! Thanks for sharing your post! 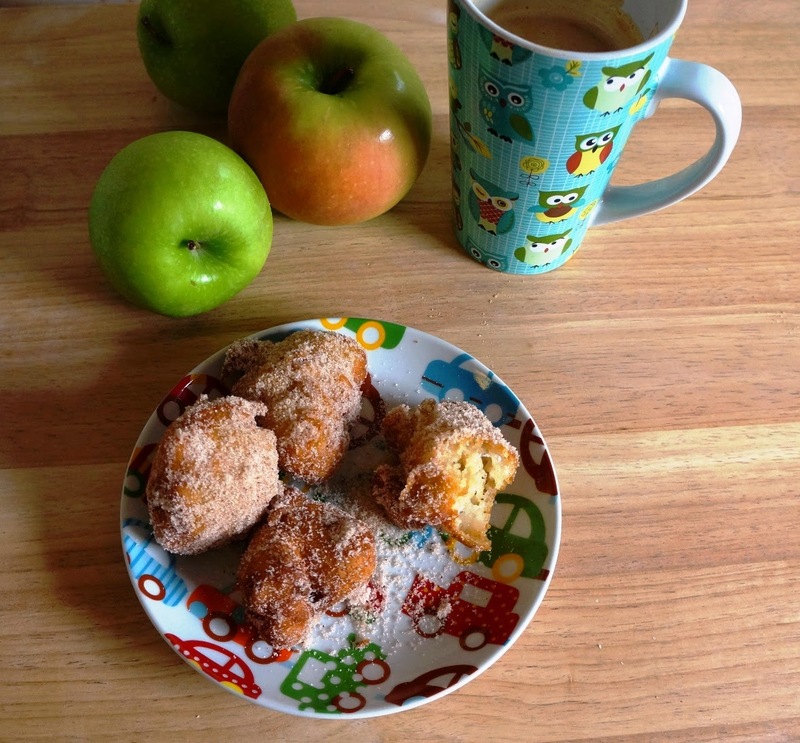 Doesnt get much better than apple fritters as a morning treat.